It's never too early to start talking about the process of shopping around for a dealer, pricing, the ordering process, deposits, and production delivery times. Although we're still months away from orders being accepted, this thread is meant to be a place where everyone can check in and share their experiences as they go through the process. I'm also going to document as many important dates in this initial post as I can. I'll attempt to keep everyone up to date on start of production, any ordering limitations, and when the ordering system will go live. Pre-Production: NOW - Captured Test Fleet Production Confirmed as of March 31st. This post will be updated whenever new information becomes available. Please contact me if you can help clarify any of these dates. Sweet! May have to talk to my local GMC dealer about ordering a 2019 Denali. I need everyone's advice on when I need to place my order. I will need to take delivery around the first of October that is when my lease is up on my F150. I would just trade it in but from what I've been told almost nobody other than another Ford Dealership wants to deal with a Ford lease. I am not ordering nothing crazy just want to make sure that a black Denali ultimate 4x4with black interior will be available when my lease ends. 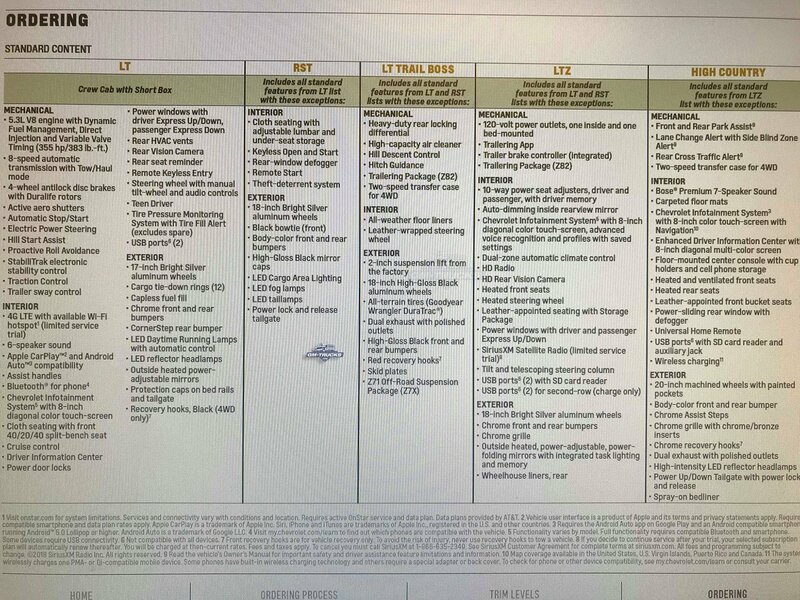 I know it usually takes 6 to 8 weeks on orders so that should put me ordering the first of August or should I order sooner since it looks like production will start June or July for the 2019's. I would hate to wait and place my order a month or two after productions start and get a 12 week or more back log. Has anyone had experience with this before and what is everyone's opinion on this. I stopped at my local GM dealer this afternoon and yes, these dates are correct. You could order your 2019 double cab today, without pricing, and he confirmed the startup dates. 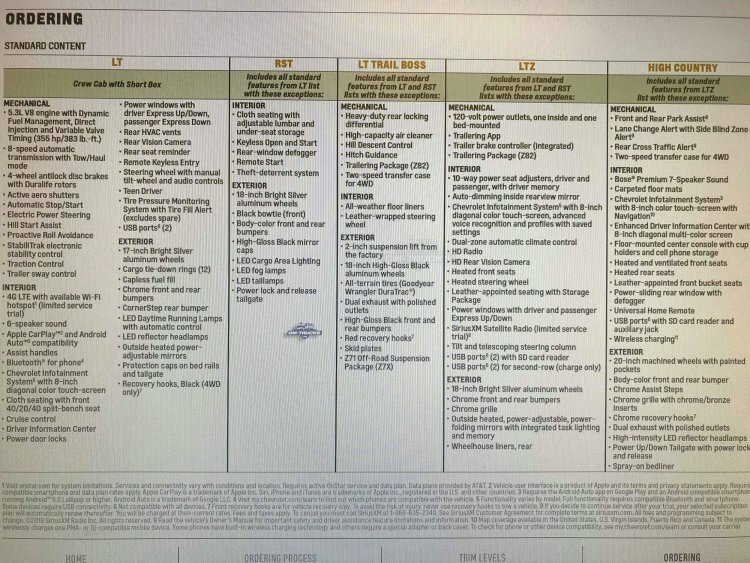 No dates listed yet for the crew cab. 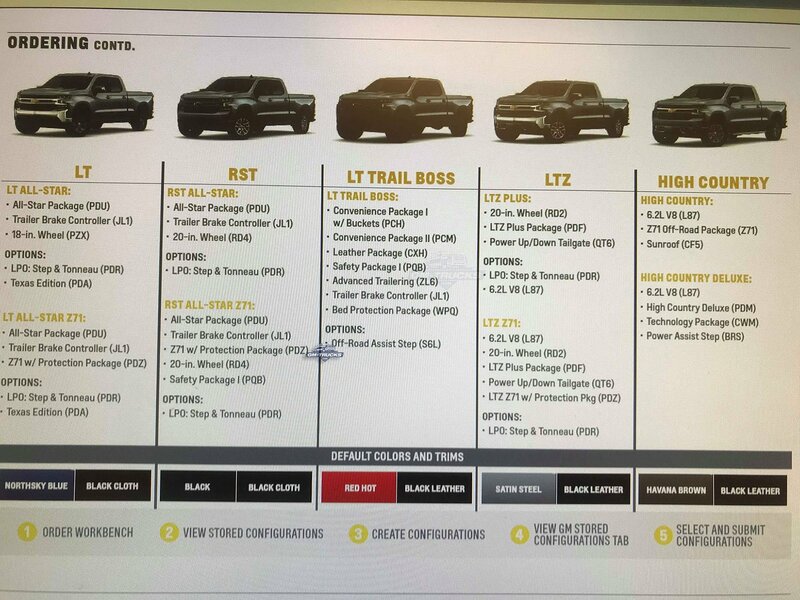 What I found interesting is on the order form, the exterior colors are the same as last year models. At least for the double cabs. It would be hard for me to order a truck with no pricing especially since most dealers will want a deposit. 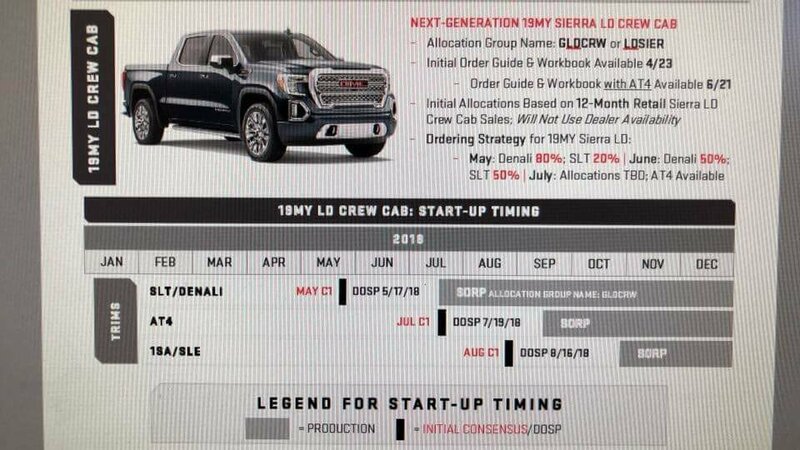 I imagine the orders for the crew cabs will start the end of April or first of May. 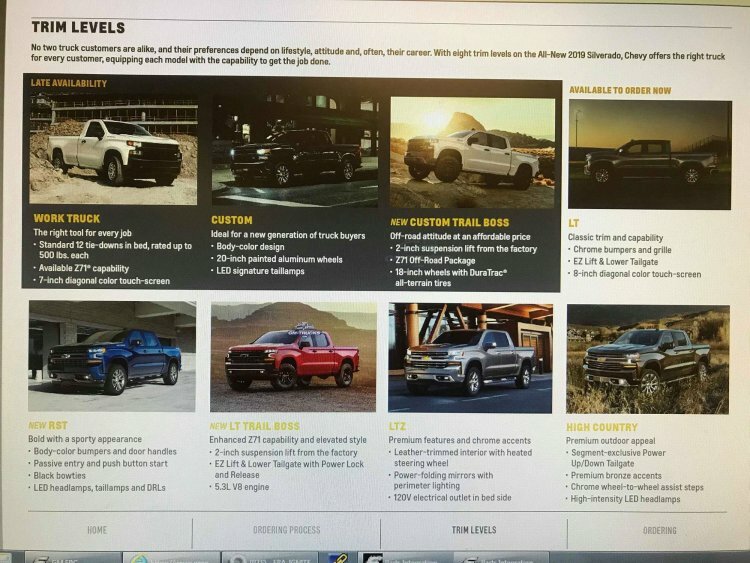 I will hopefully be ordering a Denali but I want to know what the price is first and what the dealer will sell it to me for before I order it. 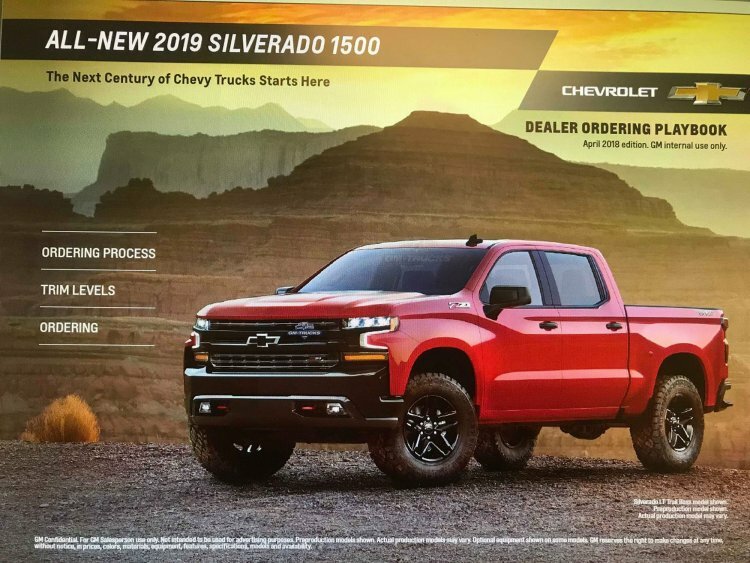 2019 Double cab ordering right now is for the OLD body style continuation trucks, aka Silverado Legacy. They start up 6/11/18. 2019 NEW body style all cabs are TBD on ordering dates and production startup. 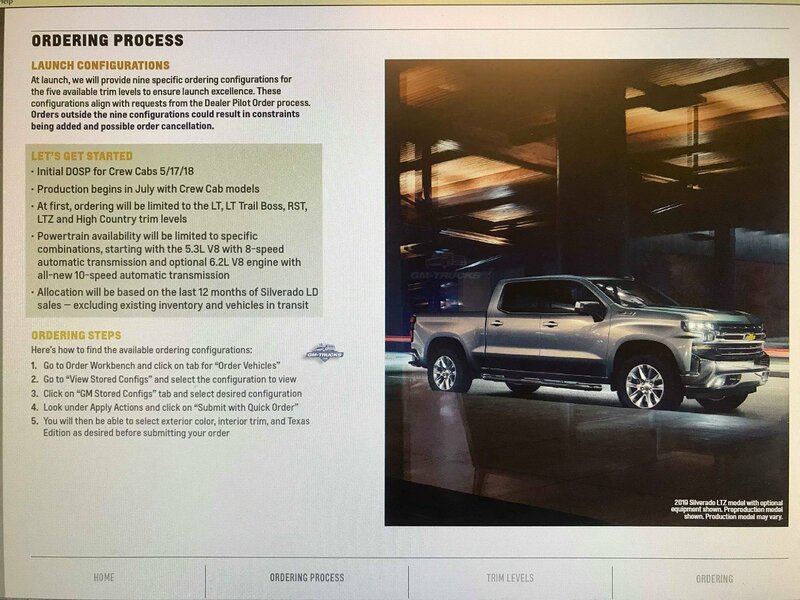 I know they have shown 3/4 ton work truck reg cab pics. Anyone seed any 1/2 to ones? I remember last time in 2013 a member here photo shopped one for us reg cab guys! 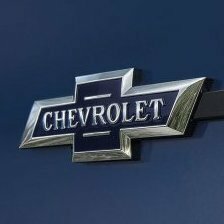 Real good question....With Ram discontinuing the regular cabs for 2019 it made me nervous Chevrolet might stop selling the consumer type regular cabs.....hopefully not ! Anyone have any update on when ordering will begin on the '19 Sierra Denali 1500? My Suburban's sound system has recently gotten blown out. Does anybody know the size for the front and rear door speakers? I'm considering on putting an aftermarket sound system into the SUV.